Trish and I have wanted to get other CAPS members to this intriguing cemetery in rural Christian County since our previous investigation in November of 2011, which was an interesting experience. 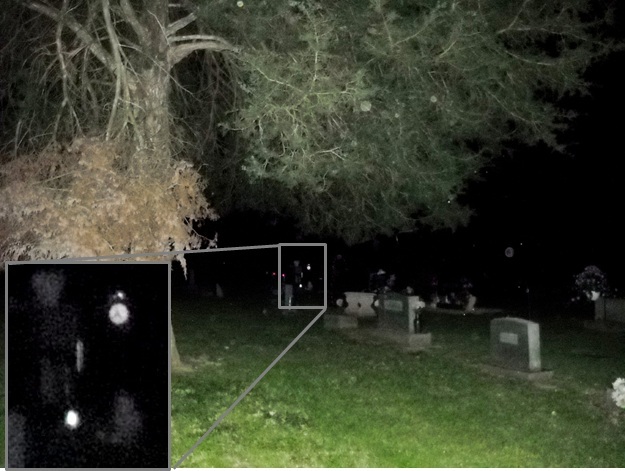 (See report, Anderson Cemetery X, Nov. 2011). We brought our group sensitive Vicki with us this time. The weather was more conducive for investigating than last time. There were calm winds and a starlit sky. Temperatures were cool, hovering in the mid 40's but not unbearable. The last time we investigated winds were howling at 30 miles per hour and with the freshly fallen leaves audio recordings were difficult. We had no such issues on this night. Immediately after crossing over Witches Bridge and turning into the cemetery Vicki and Trish both say they saw an unexplained light in the middle of the grounds. 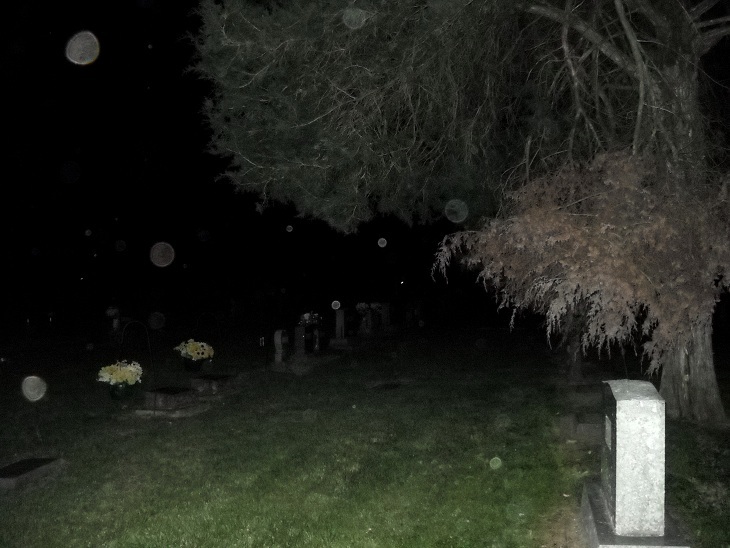 It could not be accounted for with any of the lights on the tombstones. Vicki would see these lights on at least two other occasions, and just before leaving Trish and I saw them also in the far Northwest corner of the hallowed grounds. We spent a good two hours on location, and as reported previously the old north section proved to be the most interesting. 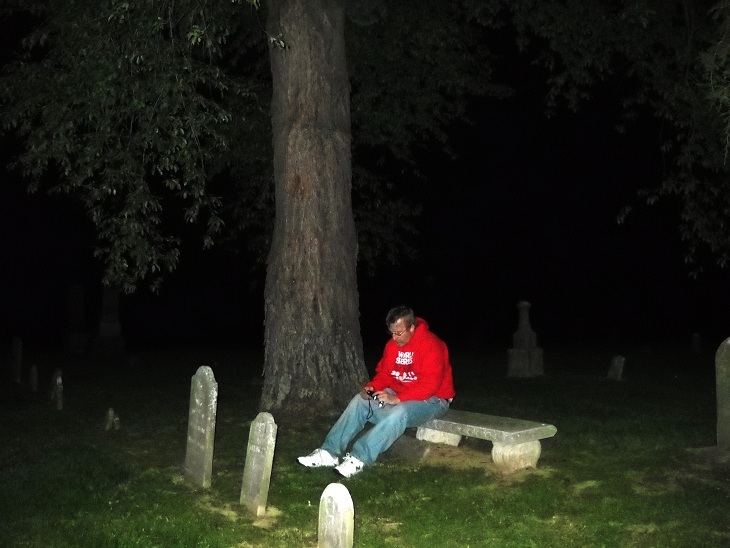 Vicki was very uncomfortable in the area near the stone bench, which sits beneath a large tree. At one point while Vicki was sitting on the bench she actually said her ankle was grabbed by an unseen hand! She obviously got up and left the area at once. This area seemed to plague her with uneasiness all night. It was in this area that an experienced investigator friend of ours was actually punched in the back and almost knocked to the ground. The calm conditions allowed us to pick up a lot of interesting audio evidence, and being located well away from any major population centers we were able to hear a lot of very interesting sounds from nature! What we confused for a Sasquatch turned out to be an innocent Barred Owl according to knowledgeable sources outside of the CAPS family!! However that being said it was noticeable at times how eerily quiet it was. There was not a sound to be heard at all for long periods of times in between the dog howls, bird screeching, and other various undetermined critter noises! Trish twice had hits on her Ghost meter when she asked if anyone were present. Both times it occurred in the old section. Fortunately she had the audio recorder running so we have the evidence to back up the experiences. Trish also experienced what she said felt like her left earing being played with while near the tree-line on the far north end of the old section. This went on for several minutes. We again got some interesting recordings during this time. It was definitely an interesting night but did not end there. Perhaps the most exhilarating experience of the night took place as we stopped at Witches Bridge for a quick investigation on our way out. We crossed the bridge and parked the car just on the other side of the structure. We got out, snapped a few pictures and did some recordings. Whilst on the bridge we saw just to the east some mysterious lights, perhaps a quarter of a mile away. We quickly determined that it was not an UFO or anything paranormal but the first vehicle of the evening traversing this desolate road! We quickly gathered our equipment and senses and ran for the car, not knowing who may be out this time of night and how they might react to us standing in the middle of the bridge. Vicki and I arrived at the car first to find it was locked. Thank goodness for keyless entry! While we waited for Trish, who we had left to her own devices, Vicki and I quickly got in and started the car. Once Trish was safely secured in her seat we got out of there just seconds before the other vehicle made it to the bridge!! Despite the mishap we managed to get some interesting recordings on the bridge! It certainly was a fun and fruitful investigation! About 8 seconds in there is a male voice, "Maybe a dove"? About 3 seconds in, a young voice seems to be saying, "Run away"
While Trish is talking at a child's grave, you hear a sigh at about 3 seconds and a whimper at about 8 seconds. At the beginning a male voice seems to say, "Very Helpful". Then a different voice seems to come in at 3 seconds and says, "Move in". There may be a child's voice at about 6 seconds, can't really make out what it might be saying. This one was captured at the Witch's Bridge, at about 2 seconds a voice that seems to be saying, "That's it" and then at about 6 seconds there is a child's voice, "Vicki"? Just a little sample of the "Sounds of Nature"
The picture taken below contained some unexplained shapes that we could explain or reproduce when we returned in early May.